VERTEX is a Hybrid HPC platform architecture where control nodes transparently connect light-weight, heterogeneous compute nodes to storage and services. Nodes running IO and control functions (VERTEX nodes) are separate from nodes running the computational parts of an application (Compute nodes). Each node is good at doing its own part, helping system performance and scalability. One VERTEX node manages and controls execution of an array of compute nodes, forming a super-node, and helping in system management, scalability, usability and system reliability. Eliminates the need for services and parallel file system management on compute nodes, thus reducing jitter (which typically gets worse in traditional kernels as the system size grows); improves compute node performance, helping in application performance scaling, and compute node reliability. To the user it appears that all compute node binaries, which could be for different processor architectures, run on the VERTEX node, helping in the usability of hybrid systems. Allows the VERTEX node to implicitly or explicitly allocate compute node resources to the application, helping in dynamic and flexible construction of a super-node. Compute nodes talk to each other using the communication fabric without going through the VERTEX nodes. Having compute node memory dedicated to computing and communication only (no IO, or system management) helps to improve communication performance and network scaling. 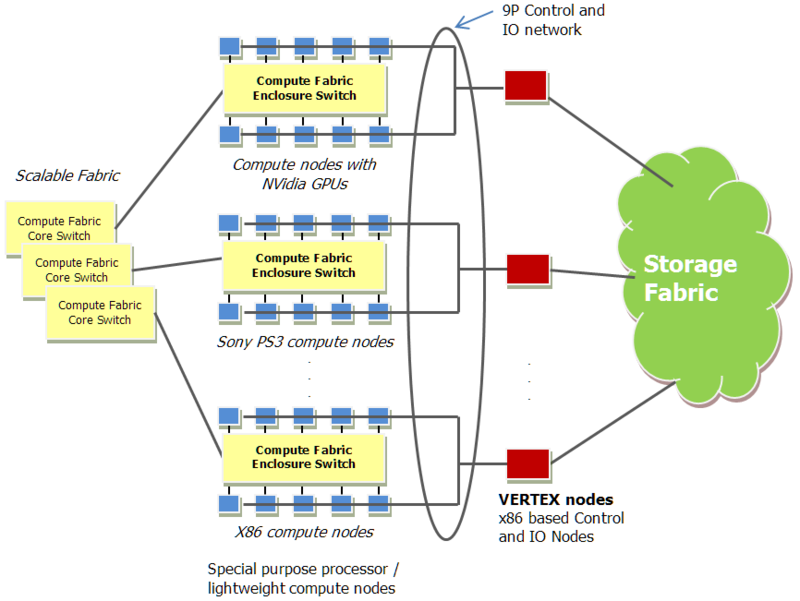 One VERTEX node handles the IO of several compute nodes, reducing complexity in IO subsystems, helping in IO system scalability, usability, and reliability. Aggregating all system management, IO and control functions in the VERTEX nodes removes the need for having traditional cluster management software and parallel IO software in the compute node, helping manage software license cost as the system scales. For more information, a full white paper is available here (PDF, 358 KB).